You will probably like this game if you like the Reversi game. 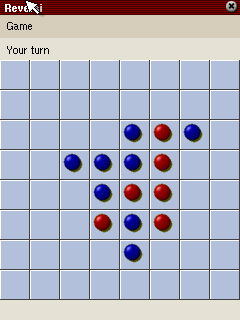 Reversi is a direct port of the board game reversi. Two players try to conquer a board by getting more pieces of their color on the board than the opponent. Pieces change their color if a newly placed piece surrounds pieces of the opponents color. The Reversi game is based on a very popular and well known board game principle. This game wouldn't be so popular if it wouldn't keep people playing it. All this fascination is also present in the Zaurus Reversi game. The opponent is played by the computer in various levels, from easy to hard. Then actually the computer plays very well. The game has no fancy options, a simple but functional graphics but all this is not really necessary in a game like this. It simply does what it is supposed to do. If you like reversi this game is a must.